How about if we suggest that you make a lovely sweet snack, perfect for a break in the middle of the day or even for a slightly unusual breakfast? Well, we’ve chosen some yoghurt croissants for you, soft and delicious, made from a brioche dough, perfect for breakfast or a snack. The recipe calls for a yeast dough of neutral character which is then filled as you wish once baked. Our advice is to fill them with a chocolate spread or with jam! Yoghurt croissants have a mild flavour, never wearying to the palate, and may be accompanied by a cappuccino or an espresso just like the classic croissant. To make them we were somewhat inspired by a really tasty version from Anna Moroni, although we decided to follow our own slightly different interpretation, perfect for true gluttons! Sift the flour into a bowl along with the vanillin, add the chopped up and softened butter, an egg and an extra yolk, the sugar, and a pinch of salt. Begin to knead and, little by little, add the yeast dissolved in warm milk and yogurt. Mix well together and then transfer the dough onto a floured work surface, where you continue to knead it vigorously for 10 minutes. Then let the dough rise in a covered bowl until it has doubled in volume. Once risen, divide the dough into two equal parts and roll each out with a rolling pin to form a circle about 40 cm in diameter. Divide each circle into 12 equal triangles and brush them with the remaining beaten egg. Roll each triangle up, starting from the shorter side. 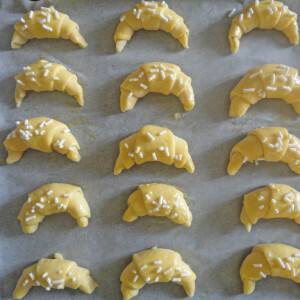 Place the croissants on a baking tray lined with baking parchment, brush them with egg and sprinkle with sugar. Let the croissants rise for another 45 minutes, then bake at 180°C for about 10 minutes. 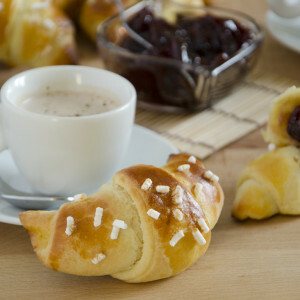 To make the perfect croissants, choose a plain whole milk or Greek yogurt since they offer the best contrast of flavour. Yogurt is a food whose origins are ancient, as evidenced by the writings of Herodotus and Homer.